Marcella M Walker (flourished 1872-1917). Walker was a 19th century female artist who lived and worked in London. She painted figure, flower and genre scenes in both oils and watercolour. 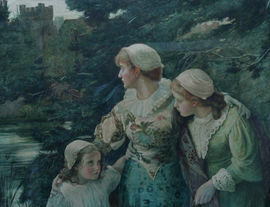 She exhibited extensively from 1880-1917: Liverpool 4, Manchester 2, Royal Academy 21, Royal Hibernian Academy 1 and the Royal Society of British Artists.